Patients undergo pharmacologic blockade before surgery to avoid the complications of catecholamine excess. Preoperative blockade consisted of metyrosine 250 mg t.i.d. and phenoxybenzamine 10 mg b.i.d. for two weeks; the dose of metyrosine is increased to 500 mg t.i.d. as tolerated. The night before surgery patients receive 50 mg phenoxybenzamine and 500 mg of metyrosine and are hydrated aggressively. A transperitoneal laparoscopic approach to the retroperitoneum similar to that employed during laparoscopic retroperitoneal lymphadenectomy for testicular germ cell tumors is suitable for most extra-adrenal pheochromocytoma. 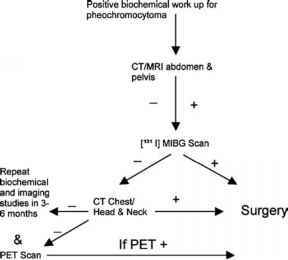 FIGURE 1 ■ Algorithm for localization of pheochromocytoma. Abbreviations: CT, computed tomography; MRI, magnetic resonance imaging; PET, positron emission tomography; MIBG, metaiodobenzylguanidine. Intraoperatively, a 7.5 MHz flexible laparoscopic ultrasound probe is used to look for other retroperitoneal masses possibly not seen on preoperative imaging or visible inspection. Unlike the adrenal gland in which a well-defined anatomy is usually consistent and predictable, there is no set pattern of venous drainage or arterial supply in paraganglioma. 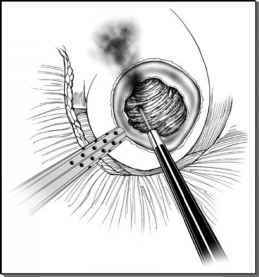 Any tumor vessel of substantial size is isolated and doubly clipped before its division. Briefly, after the induction of general anesthesia, the patient is placed in the lateral decubitus position. A 10 mm Hassn port is initially placed near the level of the umbilicus along the lateral border of the rectus muscle and used to insufflate the abdomen. Lateral port placement allows good visualization behind the great vessels. Using a 30° lens laparoscope, two (5 or 10 mm) working ports are placed in the ipsilateral abdomen in a triangular shape. Patients with small tumors not requiring many 10 mm clips may be treated using 5 mm ports. In patients with right-side paragangliomas (inter-aorta-caval or right renal hilar tumor), an additional port is placed in the midline caudal to the xyphoid for liver retraction as needed. For right-sided tumors below the renal vein, the ascending colon and duodenum are mobilized and retracted medially to expose the entire retroperitoneum. Left-sided tumors are visualized after mobilizing the colon medially to the aorta. The full flank position usually allows the overlying structures to fall medially after mobilization. An additional port for retraction can be added if visualization is not adequate. The inferior vena cava and right renal vein are identified, and borders carefully defined using sharp and blunt dissections in the area of the tumor. The right gonadal vein and ureter are isolated and retracted away from the tumor as necessary. Care is taken at the insert of the right gonadal vein to prevent avulsion requiring suturing of the vena cava. For left-sided tumors, the descending colon, distal transverse colon, spleen, and distal pancreas are mobilized as needed and allowed to be retracted medially by gravity. The lateral margin of the aorta is identified in the location of the tumor found on preoperative imaging. The renal hilum can be defined and the right renal artery traced proximally to its aortic origin to define and preserve this structure if tumors are located in this area. At the inferior pole of the kidney, the ureter is found just lateral to the gonadal vein and isolated laterally for safety. After the retroperitoneum is opened adequately and inspected visually, we perform ultrasonography to better examine the surgical field. Once the paraganglioma is located and its margins defined, the tumor can be mobilized away from the great vessels and the renal vein. Unlike the adrenal gland in which a well-defined anatomy is usually consistent and predictable, there is no set pattern of venous drainage or arterial supply in para-ganglioma. Any tumor vessel of substantial size is isolated and doubly clipped before its division. Once the tumor is freed from its neighboring large blood vessels, the remaining dissection is performed using harmonic scalpel or clips. Care should be taken to occlude any lymphatic tissue to prevent a postoperative leak. A formal lymph-node dissection is not routinely performed, but tried to remove all tissue in the area of the tumor, skeletonizing the great vessels and prevertebral fascia. The surgical field is also carefully examined for any enlarged lymph nodes. The finding of pheochromocytoma metastases on frozen section could lead to a wider excision, either laparoscopic or open. The tumor is placed into an Endocatch®a bag and removed through an enlargement of the camera port. After hemostasis is evaluated at low pneumoperitoneum pressure, the surgical area is reinspected visually and with ultrasound for any tumor remnant. Port sites are closed in the standard fashion.